I made Key Lime Pie for the first time last year when I came across the small limes while grocery shopping. I picked them up having only tried Key Lime Pie once and not caring for it and unsure how easy or difficult the pie would be to make. A quick call to friend and a Google search later let me know it wouldn’t be all that bad. And after my second tasting of Key Lime Pie I was hooked. Unfortunately key limes aren’t something that are readily available in my area throughout the year so I haven’t gotten to enjoy the pie since last year. Granted, I have seen key lime juice in the baking aisle of my local supermarket, but, I have a feeling that using the bottled juice just won’t taste the same as the freshly squeezed version. 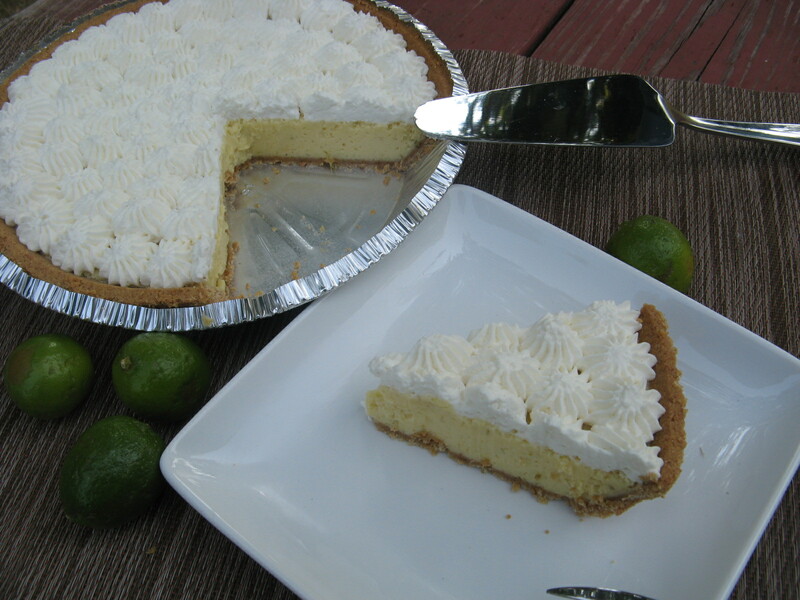 During a recent shopping trip I came across the limes once again and without hesitation I bought a bag and made another Key Lime Pie and just wanted to share the recipe with you all once again. 4) Add in the lime juice and finally the lime zest. 5) Pour the filling into the graham cracker pie shell and bake for about 20 minutes, or until the filling is set. 6) Let the pie cool completely on a wire rack and then cover and refrigerate for a few hours. 7) Decorate with whipped cream or save for serving and drop heaping spoonfuls of whipped cream on each slice. Whip cream and sugar in a large bowl until soft peaks form. Add in the vanilla extract and continue whipping until stiff peaks form.